Autumn and Winter are my favourite seasons for fashion. I am the kind of person who buys an excessive number of coats and jackets year round in preparation. Some people like shoes and bags (which I do too) but my main weakness is a good coat or jacket. 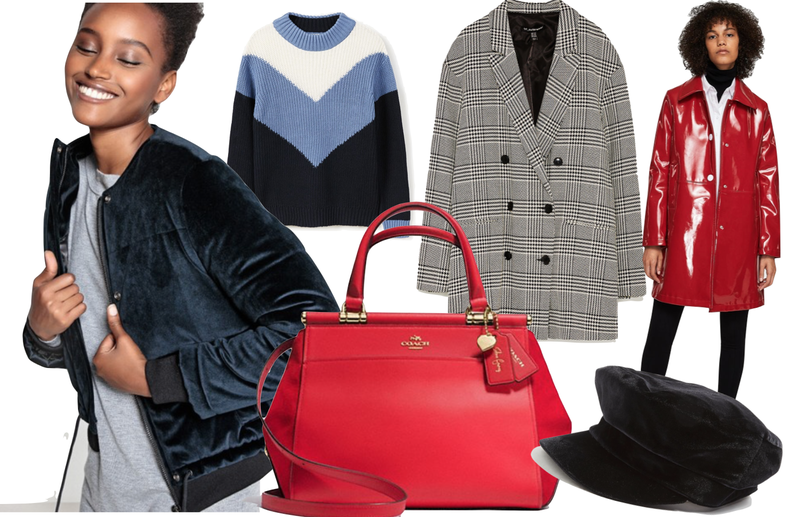 Here I have listed my top 5 trends for winter and I’ve included a few options for each trend; an item to save on, an item to spend on and an option for those of you who have a bit of extra money and want to splurge on something special this season. Oh my god. A trend I’ve been dying to give a go since the beginning of summer. I didn’t have the confidence to pull it off until more recently but it isn’t a trend I see vanishing any time soon. The first person I saw rocking a velvet bomber was Tess Christine about this time last year. As soon as I found out where the velvet bomber of my dreams was from I headed online to buy it but it was out of stock. I have genuinely searched day after day to find one. Weekday answered my prayers and I snapped it up (they also do it in a mustard shade). They are such a cool, more wintery take on your standard bomber. Is this a stupid suggestion? I mean a cool one; not just a plain one (not that there is anything wrong with them). Think stripes or a chevron or a cool colour. Just have fun with it. September 2017 saw this trend exploding. They were everywhere from Instagram to fashion week. This trend is perfect for everyone, even my Mum is loving it. A slightly more vague trend but RED is the colour of the season and I am currently trying to buy red everything.